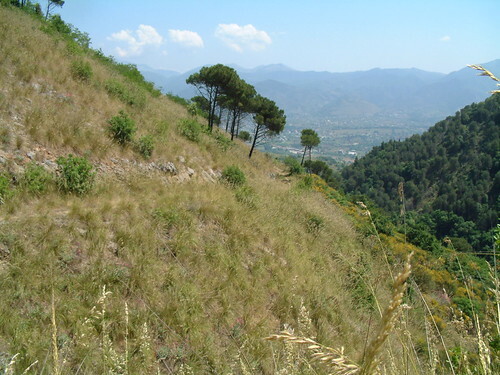 The Cavendish Road was an old mule track up the mountain side between the village of Caira and the ground beneath the monastry at Monte Cassino. In preparation for the Third Battle of Cassino Indian and New Zealand Engineers worked under an officer of the 4th (Indian) Division named Lt-Col E.E. Stenhouse DSO who named Cavendish Road after the street in Bournemouth where his father lived. These engineers were set with the task of improving this track so that tanks could move up it to try and outflank the German positions at Monte Cassino. In an incredible feat of battlefield engineering this was achieved, although the tank assault which followed was less than decisive. 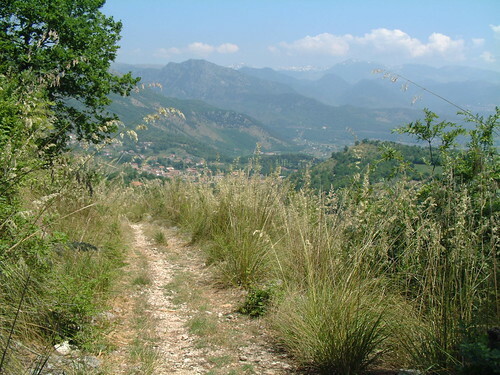 The track remained in use for the rest of the battle and the Poles utilised it for their own tank advance in May 1944 in support of the final assault on the rubble of Monte Cassino. I’ve walked Cavendish Road on a number of occasions. It remains in good condition generally and is a testimony to the skill of those engineers in 1944. It seems incredible that Shermans, Stuarts and Priests all made their way up it when you walk the ground today, and one section ends in a huge thicket, meaning you have to walk round to get to the far end just short of Albaneta Farm. The area which now includes Cavendish Road was recently given Regional Park Status and in 2013 it will be cleared up, the track repaired and made fully open to walkers in a way that hasn’t been possible for many years. Some of the work is being done by the local archaeology team, the Gustav Line Group. I may have used this track when carrying supplies at night in 1944. I was a driver in the jeep platoon. we pulled trailers with our jeeps. I am now 91 years old. Thanks Harry. What unit were you with at Cassino? Hello Paul. My main unit was 237 Coy RASC with 78th Battle axe Div. I was attached to the jeep platoon at San Michele We did night runs to serve Hangmans Hill and Cairo over the mule tracks. We also moved the West Kents into the railway station to relieve the New Zealanders.Previously I had been driving Austin and Dodge ambulances with 217 Field Ambulance. Thanks Harry – and thanks for taking time to comment here. Much appreciated from a veteran like yourself. I have a special interest in the Battleaxe Division as an old friend served with them in 5th Northants and I have had lots of 78 Div veterans on tours with me in Italy. Many thanks for your comments here. My father too was in 78th Battleaxe Division. He was in 56 Recce. Hello again Harry. I see you have told your story on the BBC People’s War site. I hope you don’t mind the link to it being posted here as it is a very interesting read. Thank you again. Thanks for adding that link Lesley.